UK online slot games are always trying to provide something new. We’ve seen this time and time again, and it pops up again now in the Super Flip slot from Play’N Go. If you play a lot of online slots, the game may not be too innovative, but we think many players will end up liking the more unusual features to be found here. 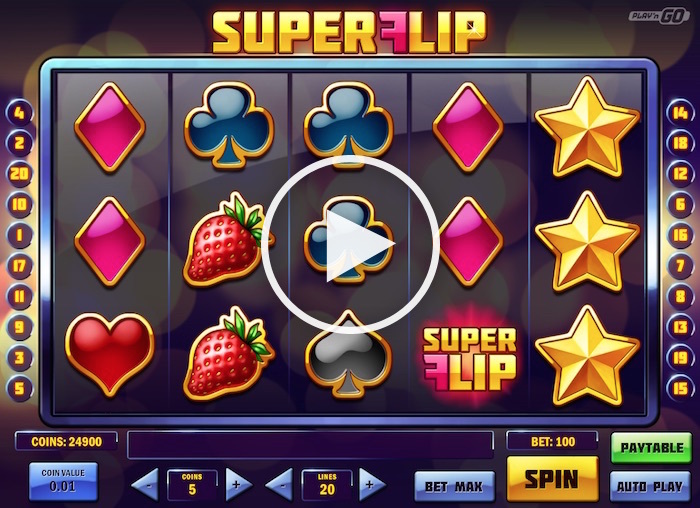 The Super Flip slot game is a 5 x 3 online slot from Play’N Go. It has 20 paylines and while the design is far from innovative, the game has enough going for it by way of features to render that somewhat unimportant. The theme really isn’t the big draw here. There are no 3D elements and the symbols will no doubt be familiar to everyone who plays it – even if your experience of slot machines is restricted to real-life one-armed bandits. But while that might put off some more seasoned players, the game has far more to offer than you’d think. Additionally, the house edge is smaller than many other slots offer, giving you a bigger RTP than you’d expect. Even though the symbols are fairly traditional in nature, they all appear with gold edging and they look rather glossy. It’s a very smooth gaming experience, that’s for sure, and the lack of a background or any real theme actually works in your favour here. All the usual controls are at the bottom of the reels in Play’N Go Super Flip, and it’s easy to adjust your coin value, coins played per line and the lines played as well. The added perk of an autoplay feature makes it easy to sit back and watch the fun too. You’ve got four pages on the payout table in the Super Flip online slot game. These explain the special features rather well, although nothing beats playing the game to figure them out in live play. You can play for free in practice mode first if you like. The biggest-paying symbols include the wild and scatter symbols, but you’ve also got a chance to find blue diamonds, gold stars, silver horseshoes and lucky clovers among other things. The lowest-paying symbols are the four card suits you’ve probably seen in other games too. The Super Flip slot from Play’N Go has some traditional features that have extra perks, as you will see here. Firstly, the scatter is the Super Flip logo. Three or more bring up some free spins, as you might expect. But here they give you flipped reels as well. Since the lines pay from left to right, flipped reels means you have more chances to scoop prizes. We’ve all played slots where three or four symbols line up from the right, meaning we don’t win a prize. But here you would, because the reels will spin and then flip, giving you a chance to scoop prizes you would otherwise miss out on. Free spins can also be triggered more than once, giving you a chance to win up to 90 of them in a row. Another great feature is the Near-Win Respin. One thing you’ll notice with this slot is that stacked symbols quite often appear. This is good because you stand a chance of getting more prizes than you would without them. When we gave it a try, we had several spins where we won three, four or even more line prizes in one go. We got a couple of big wins as well. 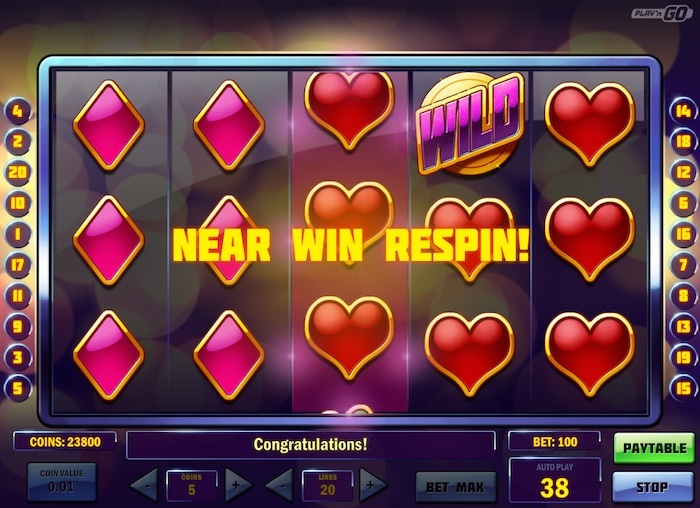 The Near-Win Respin feature triggers automatically whenever you get a full reel of the same symbol appearing on the first and second reels in the game. Wilds can be included in this. If this happens and you still don’t get any wins from it, the third reel spins again for free, which gives you a second chance to win several prizes as you play. It’s a nice bonus feature that can pay out well for you. Here’s where it gets interesting. The highest-paying single symbols are the wild word and the Super Flip scatter. Both of these pay out 250 coins for getting five on your screen – either on a single line for the wild or appearing anywhere for the scatter. However, if you manage to get wilds filling up all 15 positions on your screen, you’ll win the biggest prize. This would be 1,000,000 coins on the maximum bet. As for placing bets, well, you can start at a mere 20p per spin. That covers all the lines with a single 1p bet as your chosen coin value. The highest coin value is £1 and you can play up to five coins on every line. The return-to-player is very generous in this game. The house edge is given as 3.47%, which gives you an RTP of 96.53%. 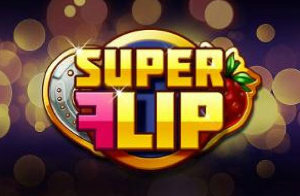 The new Super Flip slot is available on numerous Play’N Go slot sites online. You’ll have to give it a try to see whether it will be one of your new favourites, but we think it has a lot to offer. You may not win 1,000,000 coins, but even getting close would be a worthwhile win, don’t you think?